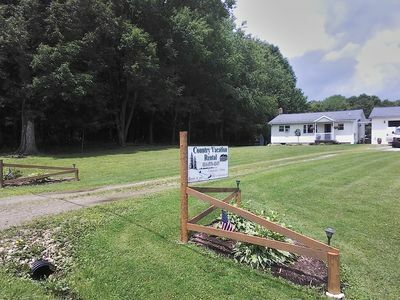 Beautiful newly remodeled updated farmhouse, on 40 + acre horse farm surrounded by state game lands in beautiful Western Pennsylvania. 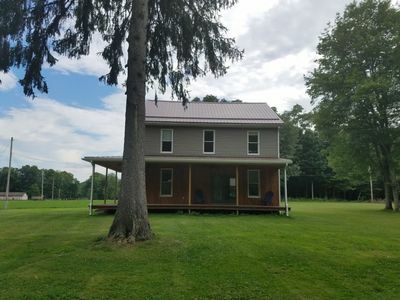 House is a 2 story farmhouse with 3 bedroom 1 full and 1/2 bath with open floor plan. All new appliances. Hardwood floors throughout entire house. 1/2 mile from Goddard State park which has a 12 mile bike trail around Lake Wilhelm. 75 miles north of Pittsburgh. You can enjoy hiking, biking, fishing, boating, kayaking and an abundance of wildlife including bald eagles that nest nearby. You may want to take a relaxing walk around the farm and enjoy the pond also located on the property and enjoy the peaceful area. Conveniently located between Pittsburgh and Erie, Pa. Not far from Grove City Prime Outlets. The house is centrally located between Mercer, Greenville and Meadville.